Put on the spot, Jason makes the snap decision to take Mallory to see where he and her father spent their Christmases as kids. The last thing he expects is to run into Tommy, his ex—ex-best friend, ex-boyfriend—who is still living in town in town… and working as a sheriff’s deputy. Jason is trying to raise his niece, Mallory. He knows that nothing he does will bring her parents back, but he knows that she needs to have some normalcy. When he realizes that he’s forgotten the holiday, he panics a little and decides to take her back to where he and her father spent their holidays. While they are driving to his hometown, he runs off the road and his ex-boyfriend, Tommy, comes to their rescue. Tommy is now the town sheriff and despite his reservations about Jason, he sees him in need of help and knows he can’t just walk away. Mallory is somewhat surly, but she’s still grieving. You can’t help but laugh at some of her antics. She knows that her uncle is trying hard to give her a good holiday and she is appreciative, just not to his face. Tommy is glad to see Jason again, but is still wary since they left on not such great terms. Jason is seeing now, leaving might have been good, but he also realizes what and who he left behind. There isn't too much romance in this story, but it's more friends finding each other again and seeing where it goes. This was a sweet story about finding the holiday spirit, love, and acceptance. Each character has to find a new normal for them and then decide whether or not they will let others in. 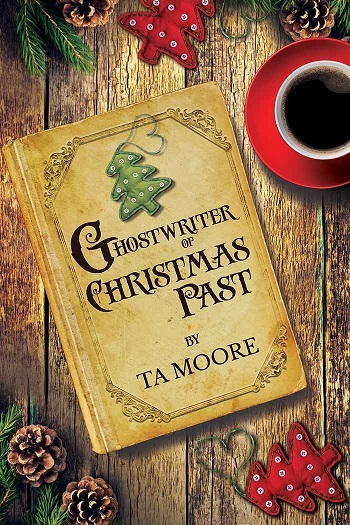 Reviewers on the Wicked Reads Review Team were provided a free copy of Stocking Stuffers: Ghostwriter of Christmas Past by TA Moore to read and review. This was such a sweet Christmas story.